Among followers of Jesus, great is often the enemy of good.The drive to be great—to be a success by the standards of the world—often crowds out the qualities of goodness, virtue, and faithfulness that should define the central focus of Christian leadership. In the culture of today’s church, successful leadership is often judged by what works, while persistent faithfulness takes a back seat. If a ministry doesn’t produce results, it is dropped. If people don’t respond, we move on. This pursuit of “greatness” exerts a crushing pressure on the local church and creates a consuming anxiety in its leaders. In their pursuit of this warped vision of greatness, church leaders end up embracing a leadership narrative that runs counter to the sacrificial call of the gospel story.When church leaders focus on faithfulness to God and the gospel, however, it’s always a kingdom-win—regardless of the visible results of their ministry. John the Baptist modeled this kind of leadership. As John’s disciples crossed the Jordan River to follow after Jesus, John freely released them to a greater calling than following him. Speaking of Jesus, John said: “He must increase, but I must decrease.” Joyfully satisfied to have been faithful to his calling, John knew that the size and scope of his ministry would be determined by the will of the Father, not his own will. 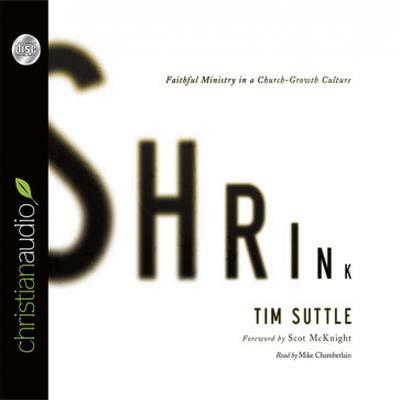 Following the example of John the Baptist and with a careful look at the teaching of Scripture, Tim Suttle dares church leaders to risk failure by chasing the vision God has given them—no matter how small it might seem—instead of pursuing the broad path of pragmatism that leads to fame and numerical success.